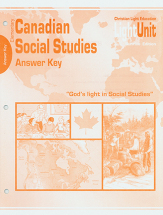 This single LightUnit along with the Teacher's Guidebook and separate answer key covers Canadian history, geography, and government on fourth- to sixth-grade level. 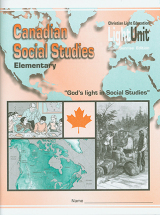 This course covers Canadian history, geography, and government on fourth- to sixth-grade level. The Teacher's Guide includes lesson plans, vocabulary quizzes, outline maps, alternate LightUnit test, plus additional teacher helps. 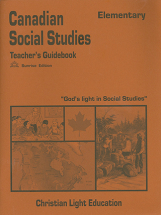 Item: T78004 Size: 8.5 x 11 Binding: Paperback Publisher: Christian Light Publications, Inc.